I saw a comment on a recent Schwarzpost about purging your excess tools, complaining about how hard it is to find vintage / used backsaws. That’s true to a certain extent, but it occurred to me that it might actually be about the same amount of effort and cash outlay to build a saw from parts as to restore a vintage saw. Sure, the fresh-built saw won’t have the same vintage appeal (or rust pits) but it ought to work every bit as well. I restored a Diston backsaw a couple of years ago, and re-shaping the teeth with a file wasn’t any picnic. I didn’t get them perfect in the end, and my saw set was too coarse to get the set quite right. I’ll go back and tune that one up as part of this post. There are a couple of places that sell saw nuts, slotted or folder backs and pre-punched plates, both ala-cart and as “kits”. Some you might want to check out are Two Guys In A Garage, Bontz Saw Works and Blackburn Tools. There are probably others. I purchased some parts from Isaac at Blackburn, he shipped the parts out quickly and has been very responsive to my naive questions. 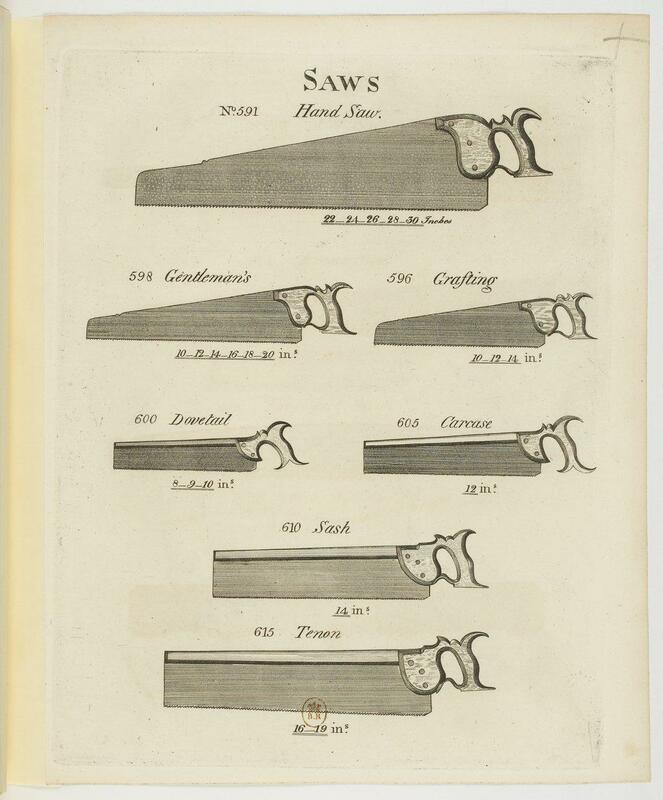 The goal is to make a saw in the style of the 12″ carcase saw that is listed in Smith’s Key. Unlike a typical carcase saw with crosscut teeth, this one will have fine rip teeth for dovetailing and small tenons. It also has somewhat less saw plate under the spine. I ordered a .025″ plate with 13 tpi. It should be a really handy all-around joinery saw. As a side note, if you haven’t downloaded a copy of Smith’s Key it worth visiting the link above and downloading the whole thing. There are a number of interesting tools shown. I also got a bronze slotted back and saw nuts from Blackburn Tools. The actual alloy of the nuts and saw back are different – Brass/Bronze ends up being a very loose definition of Copper-based alloys, and many different alloys are sold under similar sounding names. In this case the saw back is “Architectural Bronze” (57% copper, 3% lead, 40% zinc) and has a yellowish-white cast, looking more like Brass than (say) Copper. The saw nuts have a much redder cast and are probably Commercial Bronze (90% copper and 10% zinc). The higher copper percentage in the alloy is clear in the coloring. Bronze saw back and nut, notice how much redder the nut is than the back. Finding alloys that match in color and have the right properties for machining is no easy feat. I think the reddish nuts will look good against the Walnut I’m planning on for the handle. 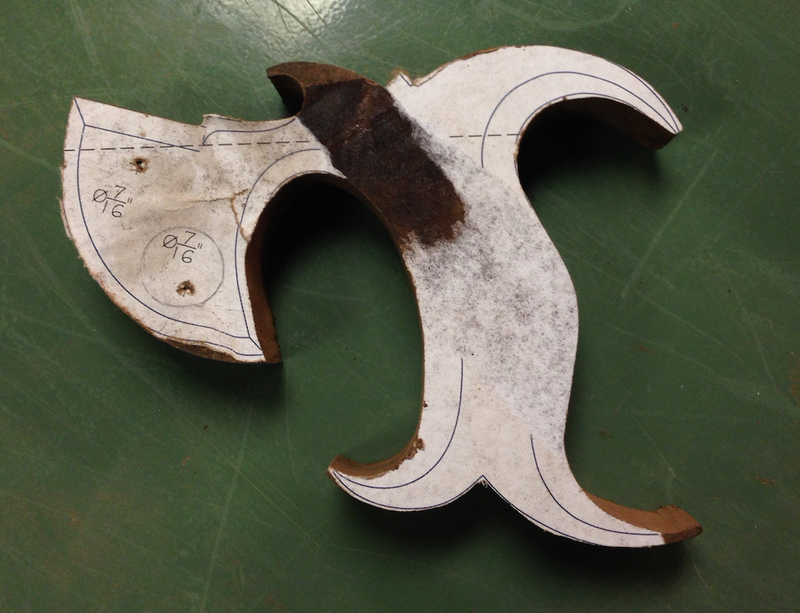 Isaac has handle patterns for many different saws, in different sizes, on his website. Actually, “Two Guys” has a lot of interesting handle patterns on their site tool. 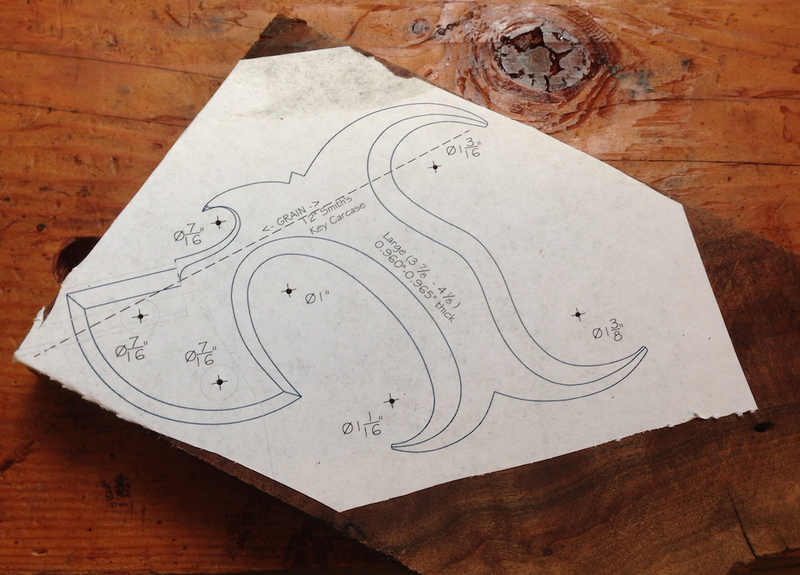 I’m using the pattern Isaac drew up specifically for the Smith’s Key saw. I really like that he has each pattern scaled for different size hands. Saw handle pattern – click on the image to go to Blackburn Tools to download the actual pattern. I am actually going to cary several blanks through the handle making process. In part, because I’m concerned about getting the slot for the saw plate in the right place. I’m also thinking of making more than one of this saw eventually, so ending up with two or three handles would be just fine with me. I have two handles going right now, one is a bit of figured Claro Walnut and another in a piece of Marbled Claro Walnut. I started by attaching a copy of the pattern to the wood with 3M Super 77. 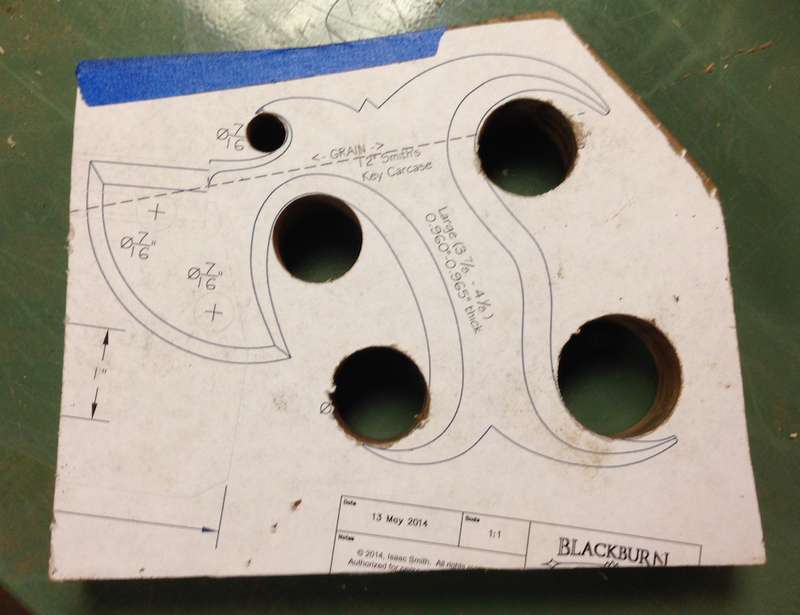 I drilled all of the holes as indicated in the pattern, then sawed the rest of the waste off on the bandsaw. I stayed off the pattern lines, so there was some hand work to do to get the handle down to the right shape. 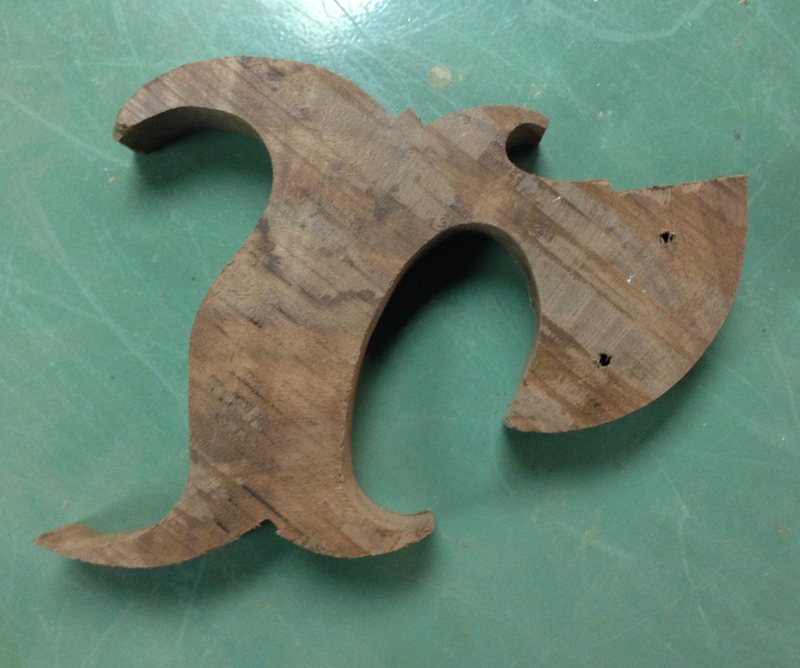 back side of first handle — the wood still has a rough sawn texture. I think for the second blank I’ll try cutting it on the scroll saw instead — I think I’ll be able to closer to the line and save some time filing and shaping. This handle looks kind of dicey in the pictures – partly because the pattern is fuzzy and obscuring what you can see. In person the contours are smooth and crisp. I filed everything, and worked most of the edges with a scraper. It’s worth noting that I shouldn’t have have drilled the marker holed for the saw nuts — on this blank I’m now locked into putting the saw nuts there. Next up I’ll bring the Marbled Claro Walnut blank up to this same point — and maybe one more blank just for good measure. Once that done I’ll cut the slot for the saw plate to make sure that goes properly. Eww! This is a very fun project. Looking forward to seeing how it turns out. I’ve made a few saw handles now, and the slot cutting is the moment of maximum stress, to be sure. I have read a couple of methods for setting up a jig to cut accurately but I always have just done it by eye and a(nother) backsaw. Results have been middling. 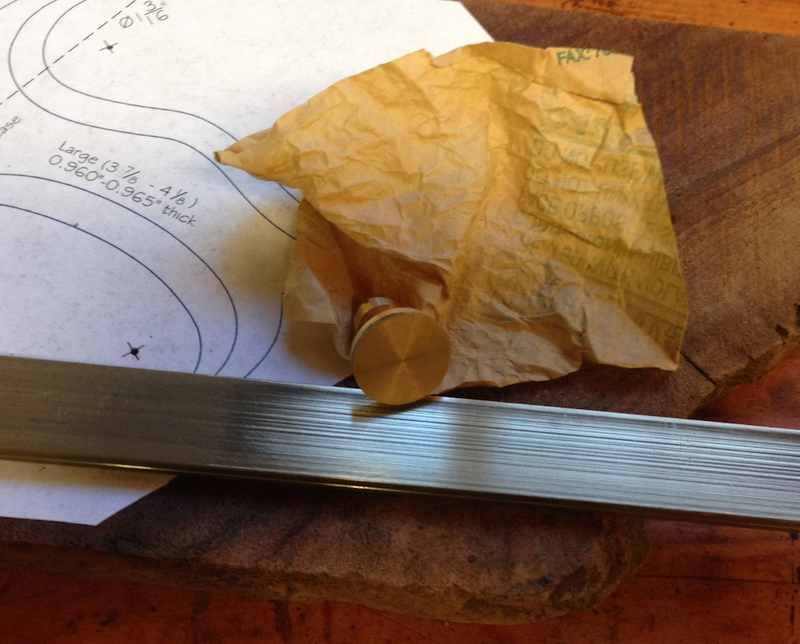 When possible cut your pattern from extra thick stock, and the thickness can be thinned preferentially to compensate for a slot sawn slightly off-center. You will be spending enough time with a rasp that any extra thinning will take no time. I’ve seen three approaches to cutting this slot. Scribing a center line and starting a shallow kerf that is then deepened, setting another saw on a riser block and using the surface of the bench to keep things in line and using a slotting saw in a mill or drill press. That last one seems like to foolproof solution since you can get slotting blades in various thicknesses. I’m going to go with the hand saw approach though, we’ll see how that plays out. Matt Cianci has a trick for doing the slot with a japanaese saw and a block of wood. Takes all the guess work out of sawing a slot that is dead centered. I will be watching. Could you make a list prices paid for components? I bought a “kit” from Isaac at Blackburn. For $51 it includes a .025″ saw plats punched 13ppi rip (there are several other choices), a slotted saw back in architectural bronze and two bronze split nuts. All the parts are available ala-cart. Slotted backs start at $16 and vary by size. Saw bolts are around $6.50 and medallions are a bit more. Pre-toothed blades are $20-$30 depending on the size.